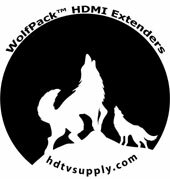 HDTV Supplys WolfPack HDMI Over Coax Extender sends an HDMI audio and video signals Over just one 75Ohm RG-6 Coaxial cable up to 300 feet way. The HDMI Over Coax Extender includes two units...an HDMI to coax transmitter and a coax to receiver. Two AC adapters are included also. The TVs must have HDMI inputs and source device send the signal must have an HDMI connector. The transmitting unit is used to capture the HDMI input with IR signals and carries the signals via one coaxial cable. The receiving unit is responsible for equalizing the transmitted HDMI signal and reconstructing IR and serial control signals. The Extender offers the most convenient solution for HDMI extension over a single coaxial cable with long distance capability, and is the perfect solution for HDMI video and stereo audio signals over coax applications. Flexible extension of high-bandwidth HDMI due to the performance and reliability of 75 Ohm RG-6U Coax cables. Audio and video are transmitted digitally over the 75 Ohm RG-6U Coax cable with zero signal loss. Single Link Range: 1080p/60, 12 bit color depth. Compliant with HDMI 1.3 and HDCP 1.1 standards. Supports digital video formats in Deep Color Mode at up to 12bits/color. Supports a Cascade function in Transmitter and Receiver and is easy to build a network system. Bi-directional IR system allowing for control of source or display (IR accessories included). This HDMI Extender carries a full HD 1080p HDMI signal plus PCM 48kHz audio up to 7.1ch. A switch on the side of the transmitter allows you to select the appropriate EDID ranging from 1080i with 2 channel audio up to 1080p with 7.1 channel audio. NOTE: This HDMI Coax Extender includes a SEND unit and its AC adapter and a RECEIVE unit and its AC adapter and both must be used. It cannot work with only one box and needs both boxes and must be used in pairs. It cannot be used to convert an incoming coax signal to an HDMI signal. Think of it as a long HDMI cable. Our HDMI Over Coax Extender supports HDMI 1.3 and HDCP 1.1 with features such as Deep Color and 1080p. By using standard and widely available 75Ohm RG-6U cables the HDMI Over Single Coax Extender makes HDMI signal extensions far easier than using heavy and expensive copper HDMI cable and with this method is more robust than using optical fiber. This HDMI Over Coax Extender allows you to extend an HDMI signal up to 100m using only a single 75ohm coaxial cable. You can use existing coaxial cables to carry both HDMI and two-way IR signals so you can use a remote control at either end of the cable to control equipment at the opposite end. The kit is supplied with power supplies, IR leads, a transmitter and a receiver. How To Install: Connect a source, such as DVD or Blu-Ray, to the HDMI transmitter using a high speed HDMI cable of up to 10 feet in length. Then connect the display, such as a TV or projector with an HDMI input, to the HDMI receiver using standard HDMI cable of up to 10 feet in length. A single home run RG-6 coaxial cable is then used to connect the transmitter to the receiver. Q: Can I use this to convert the coax cable coming out of my wall to HDMI? A: NO! Think of it as a long HDMI cable. This HDMI Over Coax Extender includes a SEND unit and a RECEIVE unit and both must be used. It cannot work with only one box and needs both boxes. The HDMI Over Coax Extender cannot be used to convert an incoming coax signal to an HDMI signal. You need both the transmitter and receiver for proper operation. They must be used in pairs. HDMI signal goes into the transmitter travels over the RG6 cable into the receiver and then connects to HDMI port on the display. Q: What are the EDID options? HDTV Supply includes a 1 Year Limited U.S. Warranty on this HDMI Over Coax Extender . The U.S. warranty states that (a) its products will perform substantially in accordance with the accompanying written materials for a period of 1 year from the date of receipt and (b) that the HDMI Over Coax Extender will be free from defects in materials & workmanship under normal use & service for a period of 1 year. In order to get a warranty replacement for a defective item, HDTV Supplys Support Team will verify the product is eligible for warranty. An RMA number will then be issued. Shipped HDMI Coax Extenders will be in like new conditions, tested and all components included. A 30-day RETURN also comes with this warranty as well as Free Lifetime Tech Support. HDTV Supply also sells a 3 and 5 Year Extended U.S. Warranty for this HDMI Over Coax Extender. Please go to Extended Warranties or see the above Options to purchase it.